There were a number of issues that I thought I was seeing. First, when I configured the Exchange settings on the iPhone, I would see Configured Sync with (null). I thought this was a little glimpse into where the sync problem was. It turns out that the iPhone inserts “null” if the name you specify for the Exchange account is too long (I verified this is the case). I finally decided to start from scratch to make sure I was not missing something. I found out how to check what version of Exchange 2003 I am running. Once I did that, I saw that I was running SP1. DUH. So, I downloaded Exchange 2003 SP2 from Microsoft, installed it and BOOM. Email, Contacts and Calendar. What a rookie move. I have the latest patch and I am still not getting it. Can u pls send me the configuration on the exchange side that has the mobiles services turned on and what to put it or key it? Please help. Hi This is Johnny again, I am still not able to get my 3 iphones to work with my exchange server. Why everybody talk about the iPhone side and no body show us the Setup on the exchange server. I have OWA up and running and everything work perfectly except the 3 iPhones cannot active sync over the AIR. Please help!!! I think the reason they don’t show you the server side most places is that the server defaults to having it correctly configured. Assuming the AD Users have Active Sync enabled and the “Microsoft-Server-ActiveSync” directory in IIS is present you should be good. One problem I’ve run into a couple of times is the face-palm of having the phone on Wi-Fi to the LAN that doesn’t route the external address to the server correctly (I.E. 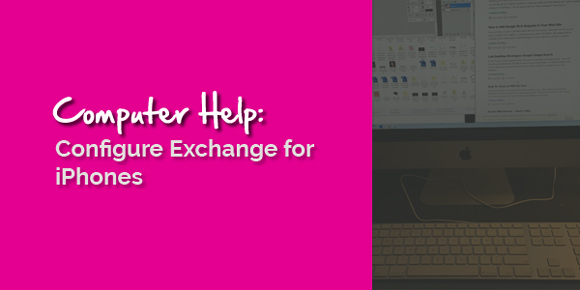 your firewall doesn’t forward internal requests for its external IP to the exchange server. We’re having the same problem. Upgraded to SP2 but still no luck. You mentioned the “Microsoft-Server-ActiveSync”, we checked and that’s listed in the Exchange Administrator, but there’s nothing listed under it. Can someone who has it working look to see if anything is in there? ‘Microsoft Server ActiveSync’ is in IIS under ‘Default Website’. You need to go to Properties, Directory Security, Then click Edit under secure communications and select ‘Require SSL Authentication’ (something along those lines). When I attempt to add an exchange account it asks for a “Server Name”. The box then says “exchange.company.com”. Where would I find out exactly what needs to be put here? My push is working with Exchange 2003, although every minute or so contact list and emails keep resetting and downloading again. Does that mean that you need to purchase an SSL certificate? We don’t currently run SSL on our Exchange server. did it too.. mine was so bad that I brought another tech company (my associates in this field) into the mix and it carried out 2 days and a load of Windows updates. I upgraded the entire server and I missed Exchange SP2. Windows 2008 and 2011 spoiled me.